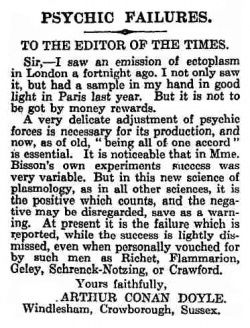 Psychic Failures is a letter written by Arthur Conan Doyle published in The Times on 12 august 1922. Sir, — I saw an emission of ectoplasm in London a fortnight ago. I not only saw it, but had a sample in my hand in good light in Paris last year. But it is not to be got by money rewards. A very delicate adjustment of psychic forces is necessary for its production, and now, as of old, "being all of one accord" is essential. It is noticeable that in Mme. Bisson's own experiments success was very variable. But in this new science of plasmology, as in all other sciences, it is the positive which counts, and the negative may be disregarded, save as a warning. At present it is the failure which is reported, while the success is lightly dismissed, even when personally vouched for by such men as Richet, Flammarion, Geley, Schrenck-Notzing, or Crawford. This page was last edited on 22 July 2017, at 15:00.